I am a Certified Financial Planner (CFP®), accredited Wealth Management Advisor (AWMASM), and graduate of the University of San Francisco with a B.S. in Mathematics. I am in this business because when I was young, and earning a great salary in information technology, I was looking for someone to guide me and help me improve my financial future. After not being able to find that person I decided to become that person! I switched careers and have never looked back! I have been fortunate to have worked with wonderful clients over the years, helping them define their vision of a secure financial future with a plan designed to help them reach the goals they have set for themselves and their families. I am especially proud that I have had clients who have been with me as long as I have been in business! I help busy, successful people on the path to financial independence so they can feel in control of their finances, and have more time to do what they enjoy; be that at work or leisure. I help people determine what they truly want from their money and organize their financial life so they know where everything is and what it is worth. I collaborate with other trusted professionals to cultivate a holistic approach to meeting the client’s needs. I utilize cutting edge financial management software that serves as a collaborative tool to use with clients and their tax and legal professionals, in our on-going planning and decision making process. Our days are filled with work, family and personal interests, leaving little time for anything else. My ideal client realizes this, is willing to delegate, and values a relationship with professionals who will act in their best interests. I act as advisor, counselor, coach and trusted partner, collaborating with tax professionals and attorneys to serve my clients. Some of my clients are high net worth individuals, but I also take great pride in knowing that I have helped a great number of people, who began modestly, design plans to build their portfolios. I Care – there are many capable advisors and planners to choose from, but I believe that I have the breadth of knowledge to offer the specialized service that I do. While my obvious focus is a client’s financial life, I am also keenly aware that there are many factors that influence our financial decisions. Whether it’s helping someone who recently lost a spouse, holding a client’s hand as they face a medical challenge, or celebrating weddings, anniversaries and new babies, I am here. This is a deeply personal business and I am your 411, 911. I have your back. I care about my clients and their success. I am Selective – I’ve worked long enough in this business to know who I work best with. I don’t judge a client by their assets under management. I evaluate their needs and determine if I am the right person to help them. Because I am an advocate for my clients, it is important for me to work with people I like and who like me. This is a trust relationship and I am more concerned about the client’s overall life plan, not just the dollars and cents. I am an Educator – I place great value on the role of education in our financial life. Bad decisions are usually a result of a lack of good information. I am committed to making sure my clients, professional colleagues and community have access to quality financial instruction. In addition to offering regular workshops in my office, and the offices of my professional colleagues, I teach at the Berkeley Adult School, East Bay Rental Housing Association, AIG, Estate Planning Council, and offer classes for Continuing Education Units for CPAs, CFPs and Attorneys. I Give Back – I provide many pro bono consultations and volunteer a considerable amount of time to organizations that promote professional education and advancement for women in the workplace. 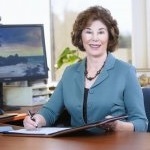 I have been President of both the East Bay Rental Housing Association and the Estate Planning Council of Diablo Valley, and am currently the Treasurer of CREW East Bay. I also give back to the community by teaching financial literacy classes at Berkeley Adult School. I am Skilled – My 30 years of experience and considerable education has offered me a great perspective on the markets and my goal is to build portfolios that will weather the ups and downs, select money managers that will help produce the results we are looking for and recommend plans and strategies designed to accumulate wealth through disciplined saving and investing. I am a coach as much as I am a wealth advisor.